Jose Mourinho is under growing pressure at Manchester United as key figures at the club believe he may have prevented them making at least four big-name signings in this summer’s transfer window. CaughtOffside understands United are growing increasingly frustrated with Mourinho’s demeanour this summer, with the Portuguese seeming to publicly hit out at the club over a lack of investment in the team after complaining about the squad at his disposal for pre-season. This has led to a report from the Sun stating former Real Madrid manager Zinedine Zidane is already being looked at as a replacement in case Mourinho ends up leaving Old Trafford. All the more damning for Mourinho, however, is a report from Marca stating that United had made a bid for Madrid midfielder Mateo Kovacic, but that despite looking to leave the Bernabeu for more playing time, the Croatian was not keen on a move to Manchester because of the team’s playing style under the current manager. 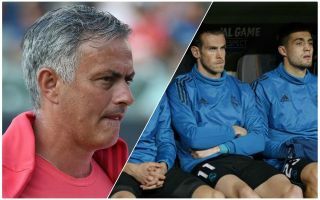 CaughtOffside understands that senior figures at United feel this may also have cost United in their pursuit of other big names like Gareth Bale, Robert Lewandowski and Sergej Milinkovic-Savic. All three have been linked strongly as top targets for the Red Devils at various points this summer and in the months preceding the opening of the transfer window, but none have come to fruition. This is despite the Manchester Evening News at one point claiming talks with Bale were even at an advanced stage, with little development since then other than the Welshman seeming set to stay where he is despite never quite fitting in in the Spanish capital. With a week to go in the transfer window, United still look in need of one or two more signings at the very least as they face the daunting task of closing a big gap on rivals Manchester City after finishing a whole 19 points behind them last season. So far this summer, Fred, Diogo Dalot and Lee Grant have come in, but it seems likely only one of those will become a regular starter for the club. If United get off to a poor start this season it certainly doesn’t look good for the future of Mourinho, who failed to win a trophy last season and who has arguably also failed to really develop the side despite winning three trophies in his first season and lifting the team to second place the following year. Many will have expected the former Chelsea boss to do more with talented players like Paul Pogba, Anthony Martial and Marcus Rashford, while investing large sums in big names like Romelu Lukaku and Alexis Sanchez has also not managed to significantly change the fortunes of the side. If a big name and character like Mourinho is now seen as off-putting to players like Kovacic and Bale, then one has to wonder what the 55-year-old really brings to a club anymore and it is little surprise that this is becoming a big cause for concern.